Photo 1: Block D of the Charlestown Secondary School after a Nov. 25 fire. Photo 2: Kevin Barrett, permanent secretary in the Ministry of Education on Nevis, is pictured inside of the burned-out classroom after a fire in Block D at the Charlestown Secondary School Nov. 27. Photo 3: A section of the burned-out floor at a classroom after a fire in Block D at the Charlestown Secondary School Nov. 25. 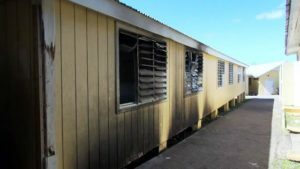 Charlestown, Nevis – The cause of a fire that destroyed a classroom at the Charlestown Secondary School (CSS) Nov. 25 has not yet been determined, but investigations are ongoing, said David Stapleton, divisional fire officer on Nevis. 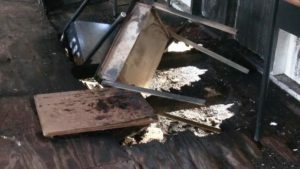 Officers of the St. Kitts-Nevis Fire and Rescue Services, Nevis Division, responded to a fire call at the school at 9:17 p.m. Upon arrival, they met a small section of a wooden building on fire. They successfully contained the flames with use of the fire tender. Meanwhile, Kevin Barrett, permanent secretary in the Ministry of Education on Nevis, described the incident as unfortunate. He thanked the fire officers for their quick response and for them promptly extinguishing the fire. The building, known as “Block D,” houses two fourth-form classes and one fifth form. The fire destroyed one forth-form classroom, but due to the close proximity of the other classrooms and health concerns for students and staff, the other classrooms cannot be utilised. As a result, more than 20 students have been displaced. 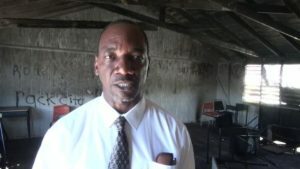 Barrett said he has already met with Juan Williams, CSS principal, and Edson Elliot, education officer responsible for the secondary schools on Nevis, to find space to place the displaced students and to plan the way forward. The permanent secretary said the fire posed a difficult situation for the school’s management and staff and he appealed to the public to volunteer any information regarding the fire. Barrett stated that on the scene of the fire, he and the Honourable Vance Amory, premier of Nevis and Minister of Education; the Hon. Mark Brantley, deputy premier; the Hon. Troy Liburd, junior minister; and Wakely Daniel, permanent secretary in the premier’s ministry and himself had a good conversation with Mr. Juan Williams, Principal of the CSS and assured him that he had the support of the Ministry of Education.